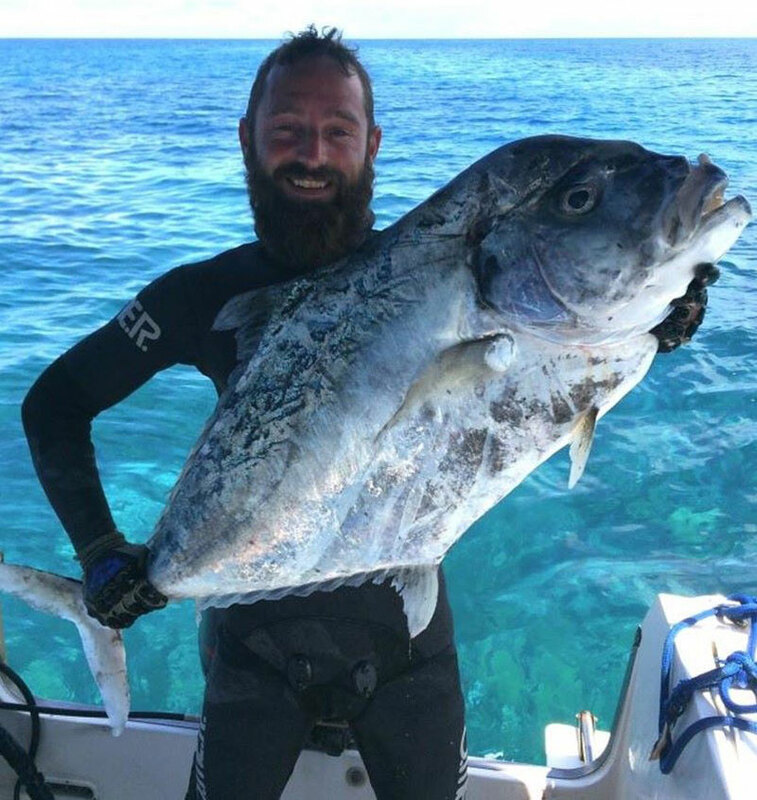 Alex Wilks has set a new International Underwater Spearfishing Association world record in Bermuda after spearing an African Pompano that weighed in at 18.1 kg [39.8 lbs] to capture the record in the ‘Men Sling / Polespear’ category. “He turned and started swimming back up towards me so I took a breath and dove down, meeting him at about 40 feet. “This time the shot was a success, right behind his gill–but not a kill shot. I held onto the rubber from my spear and fought for the surface, gaining ground but was worried the fish would take off and break the rubber from the spear as it was very active. “I then grabbed the spear itself but was having trouble getting to and staying at the surface because he was strong and tiring me out. You wicked , wicked man ! Imagine getting speared ? Good for you Mr. Wilks – you look so proud…lets hope one day you are not the hunted. I take it you ^^^ are vegans right? Talented! Congrats on your record! Hey mate, if you decide to part with it, im looking to buy some fillet. Well Done Mate that is an excellent achievement. The publicity will help the island. Kudos! I hope the people who made negative comments are vegans who don’t wear leather, or silk or wool! You should not have speared that beautiful creature. Hope it wasn’t a female. Shame. Spare us. Hundreds of fish are caught off Bermuda daily. And then there’s the lobsters. Yum! To all the people complaining about this fish being caught… This is ONE fish caught using a small scale technique by a local fisherman. If you want to complain about something, complain about international fishing vessels that come into our waters and catch thousands of fish a time with nets and techniques that destroy the ocean’s floor/ ecosystem. You’re all complaining about the wrong thing. Pah.. veggies vegans animal rights folk. This is about the most natural way to catch something pick on the right story. I saw a good joke the other day… I was trying to work out how to make eating green stuff more exciting…… feed it to a cow so you can have a nice juicy steak. Great catch, an easy fish to spear but not to keep on the spear. A fish of that size has Ciguatera written all over it though. Vegetarian or not, this man with a spear,mask and snorkel dove down into the sea and got this catch only with skill. This is cave man s#!t! Amazing! Fair game when you don’t use anything but a spear. Fish are crazy fast and to spear one is pure skill! I applaude you, you truly are amazing!